We booked the room direct via the Premier Inn website, where we paid £145.98. This included our room for one night, a 2 course dinner, breakfast, and (£5 for) Ultimate Wi-Fi. We flew with British Airways again this year, and was able to do bag drop the night before our flight. With the Premier Inn being so close – literally across the road from the terminal -we popped over to the airport first to offload our suitcases, and walked back across the road to check into the hotel. If you are travelling from the South Terminal, there is a free shuttle train that you can take. There are 9 (or maybe it’s 10) floors to this Premier Inn, with 4 elevators servicing the floors. You enter on the ground floor and take the lift up to the 1st floor where the self-service check-in stations are. There are several members of staff to help you along the way. In our past experience, we always seem to be allocated a room at the furthest end of the hotel. For me this year, that wasn’t going to work, because I have trouble walking a long distance. I requested a room closer to the elevators and amenities, and a staff member was happy to help. 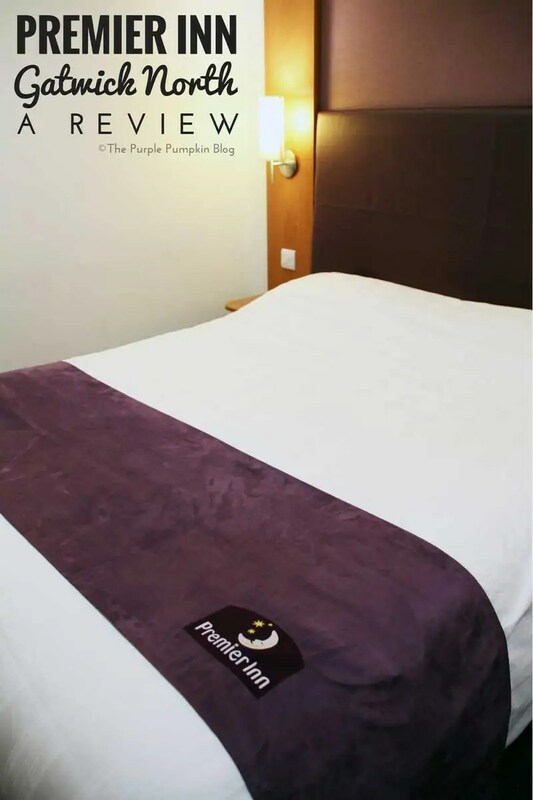 Rooms at Premier Inn are quite standard across the board, and all the ones I’ve ever stayed in just look the same – that isn’t a bad thing, as you know exactly what you are getting. They are well appointed with a comfortable bed (and extra pillows), sofa (which can be turned into a bed, and that we’ve used in the past when we had my son travelling with us), desk and chair, side table, television, hairdryer tea/coffee making facilities, and free Wi-Fi. The wi-fi is limited to a certain number of devices, but you can pay a small fee to use it on more than one device. There is also a unit with a hanging rail (and some hangers), a drawer and shelves; as well as plenty of space for your luggage. The bathroom has a bath with overhead shower, sink, toilet, dustbin, towels, and a dispenser with soap/shampoo. 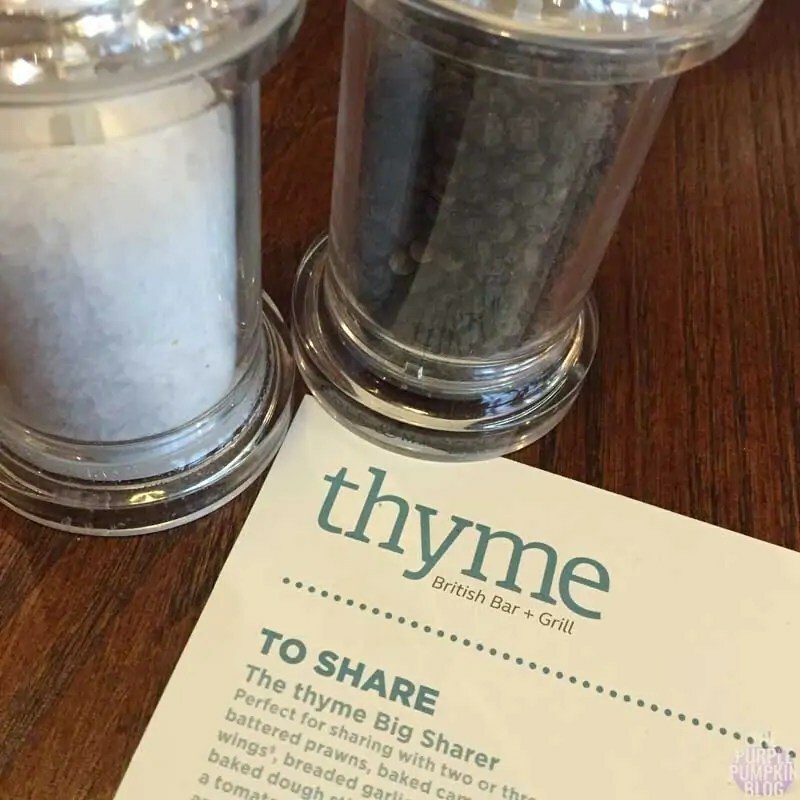 There is one restaurant in this Premier Inn – The Thyme British Bar & Grill. It is a large restaurant with lots of tables, but it is wise to book a table as soon as you get to the hotel, as it can get very busy. We knew this from experience, so put our names down before we went up to our room. We had our table booked for 6:15, and not long after we were seated, quite the line grew at the hostess stand, so I’m glad we got in there quick! Our server was friendly, and the service was speedy. We didn’t have very good service the last time we dined here, so it was good to see an improvement. As part of the price we paid for our room, we could have a 2-course dinner – either a starter and main course, or main course and dessert. You can bump this up to a three course for a few extra pounds if you wish to do so. A drink is also included – either a pint of beer, glass of wine, or a soft drink. I decided to start with a classic prawn cocktail, and had a chicken and bacon salad for my main course. Steve had chicken wings for his starter, and a mixed grill for his mains. The food was delicious and hot. We decided to forgo a dessert, and later returned to the Costa Coffee next to the The Thyme to grab a coffee and some cake. As I mentioned, there is a Costa Coffee next to the restaurant where you can get lighter bites to eat, as well as hot and cold drinks, and sweet treats. We got a couple of iced coffees later in the evening, and some yummy carrot cake too. When it comes to staying in a hotel, we all know that breakfast is very important! 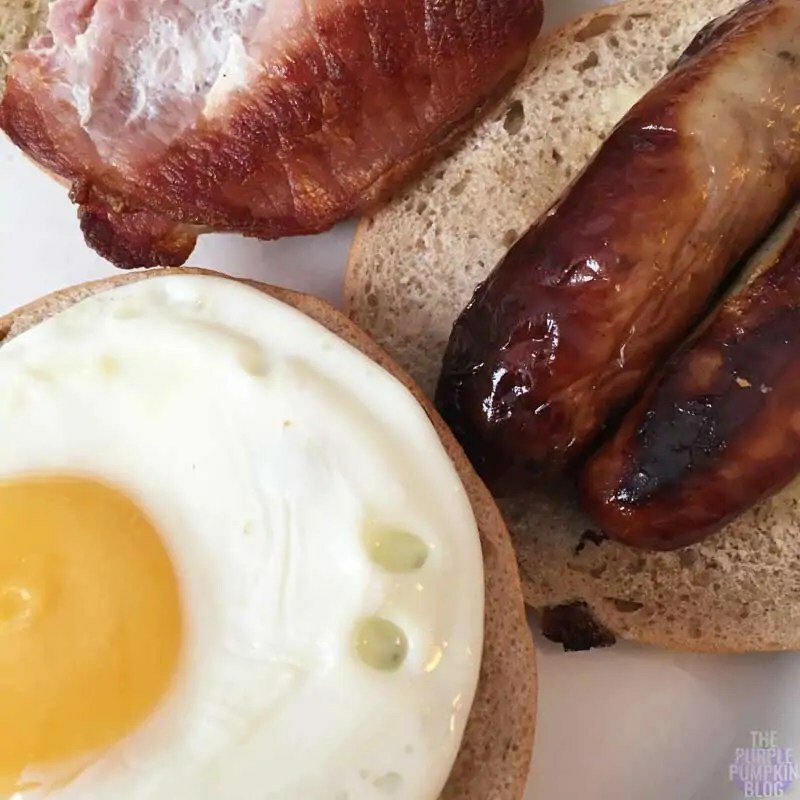 Breakfast at the Premier Inn, Gatwick North is served in The Thyme, buffet style, where you can help yourself to a full English, various breads and pastries, cereals, yoghurt, fruit, and of course tea, coffee, and juices. I was in no mood to go down for breakfast the next morning, I was full of nerves for the upcoming flight, and feeling a bit queasy. Steve went down on his own to have some breakfast, and took some photographs for me. He also brought me back some breakfast, in case I changed my mind. By which time, I actually had – good job hubby! For more details about Premier Inn, Gatwick North, you can visit the website here. I doubt this will be our last stay at this hotel, and look forward to returning again on our next trip via Gatwick Airport.